It all started with my Dad’s 70th. For anyone that has had the pleasure of meeting him, to say he’s ‘a bit of a character’ is an understatement! 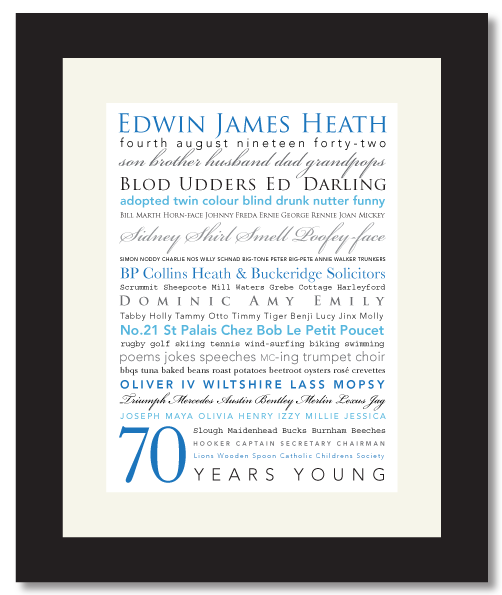 We decided to put together a memory lane print for him and started by listing his favourite things, places, key people in his life and lifetime achievements. My family and I had a good giggle compiling it and I really enjoyed designing it. We were thrilled with the result and more importantly so was my Dad. Further more, various friends and family were also keen to create similar prints for their loved ones. Naturally creating the prints and putting together this website was the easy part. The hard part has been finding the time between my client work and looking after my 2 small children Jessica who is nearly 3, and Rory who is 9 months. This could not have been done with the help of my trusty childcarers, my mum, sister and childminder to whom I am extemely grateful! Now I’m not trying to reinvent the wheel as I am, by no means the first person to be doing this! However I hope the unique designs I have created and my attention to detail will stand me in good stead. Have a browse, and if you like what you see please feel free to spread the word… word of mouth, is after all the best marketing tool!